Hello! This is a much requested post from many of you, who contacted me in private requesting for my comparison table, so I've decided to share my findings publicly here. All data are consolidated from my individual meetings with the sales representatives across all three companies (so if there's any data that is wrong / outdated, please let me know so I can change it, but I will not be held liable for any misinformation in this table as I'm merely replicating what their sales reps told me!). 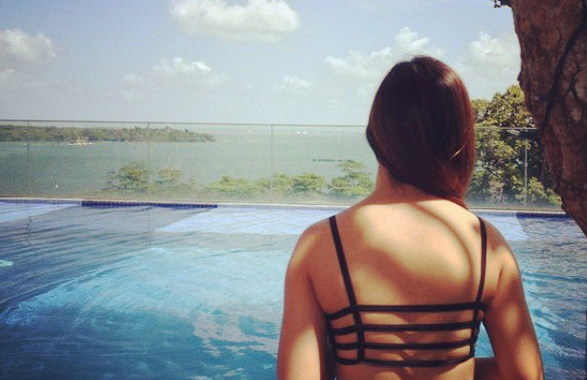 I've also previously written on whether I feel cord blood banking is necessary, and why I'm not entirely for the idea of donating it to the Singapore Cord Blood Bank (SCBB) vs. storing it privately here. I've also reviewed about how SCBB's Family Banking Initiative costs stack up against the private banks - essentially it works out to be almost pretty much the same, except that you don't get any freebies (such as $300+ UV sterilizers for baby bottles and hygiene and/or insurance, so it actually pales in comparison from a value perspective). Note: All cord blood banks operating in Singapore are required to have MOH license. Not able to store cord lining. Want the most flexible pricing plans with low commitment? Stemcord. Want the one with the best track record / technology / reviews / want to store all 3 types of stem cells? Cordlife. We first eliminated Cryoviva because although it certainly was the cheapest - we were offered $4,950 after GST with a free Hanil UV steriliser - we eventually figured that we would rather pay more for a company with either FACT and/or AABB accreditation for a greater peace of mind. As Cryoviva's labs are the newest, it lacks the accreditation that the other two banks and SCBB have - they only have MOH license and ISO certification thus far, but so do the rest. (Previously, Cryoviva was renting and sharing the space with SCBB for cord blood storage.) Theirs was also the only contract which did not contain a legal clause stating that the cord blood unit will be transferred to another private bank or its equivalent if Cryoviva ever shut down, and I had to request for this legal clause to be added in instead (and it wasn't). Stemcord was next to go. While we liked the flexibility of their price plans and the idea that they were set up by medical doctors (they're the only bank that allowed for a no-commitment package consisting of $1,450 enrolment fee and $275 per year for storage) and their transplant insurance (they offered a complimentary $50k payout to cover transplant costs if your autologous cord blood is used in the future, upon approval from their medical doctor), we were already sure that we wanted to go for a 21-year plan with upfront payment so we don't have to worry about it for the next few decades. Moreover, they were also the most expensive, but we didn't feel like they were necessarily the best out of all the three banks. While their sales rep emphasized on the fact that they're the only private bank to store the cord blood in two separate units, I'm not entirely convinced since most transplant cases up to date have involved using all the blood for maximum effectiveness. Ultimately, how much to use will be determined by your doctor anyway. In addition, my research online later led to this realisation that Stemcord's co-founder, Dr. Ang, was fined by the Singapore Medical Council in 2016 and later suspended for 8 months over charges of professional misconduct. Call me paranoid, but this certainly worried me and made me reconsider if I should be banking there. 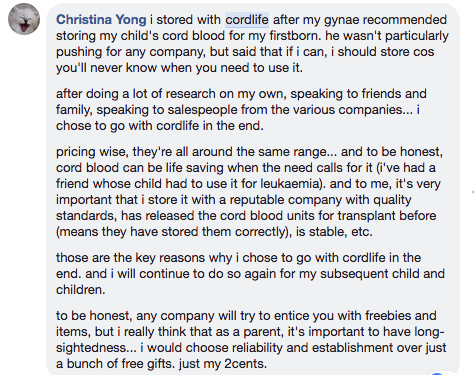 A forum post also then showed that Stemcord seemed to have lost one of their client's cord blood before and the client was accused of not making payment about 4 years after she first started storing her children's cord blood with them, when she wanted to retrieve one. I'm not sure what the latest status of this case is, but I only know this sort of emotional rollercoaster ride is not something I want to ever have to experience as a mother, and so my husband and I decided that we would rule Stemcord out for these reasons and more. In terms of processing quality, Cordlife is also the first private cord blood bank in Singapore to offer the Sepax®2 automated processing technology, which can recover as high as 99.88%1 of total nucleated cells from cord blood. It is also a functionally closed processing system which ensures the sterility of the cord blood by eliminating exposure to air contaminants. Stemcord, on the other hand, was previously using a manual closed system (triple bag) which has only 82% recovery, but I was heartened to find out from their sales rep that they've since switched over to Sepax-2 since 2012. After maximising the recovery of total nucleated cells from cord blood, the next important step is to carefully prepare the stem cells for cyropreservation, so that the cells can be stored indefinitely while retaining its viability for use in treatments. This is crucial, because you don't know how many years later you might be needing it, so long-term viability and storage is extremely important. Cordlife is also the first family cord blood bank in Singapore to adopt this fully automated cyroprotectant infuser, mixer and cooling device, Smart-Max, which mixes the cyroprotectant with the stem cells in a uniform manner, thus eliminating the need for human intervention (and thus any chances of human error). Because cord blood storage is for the long term, the track record of the company is more important to me than simply going for the cheapest option. After all, surely you wouldn't want to have paid all that money only to find out years down the road that the company has filed for insolvency! 1. They have the longest track record with the most number of successful transplants. 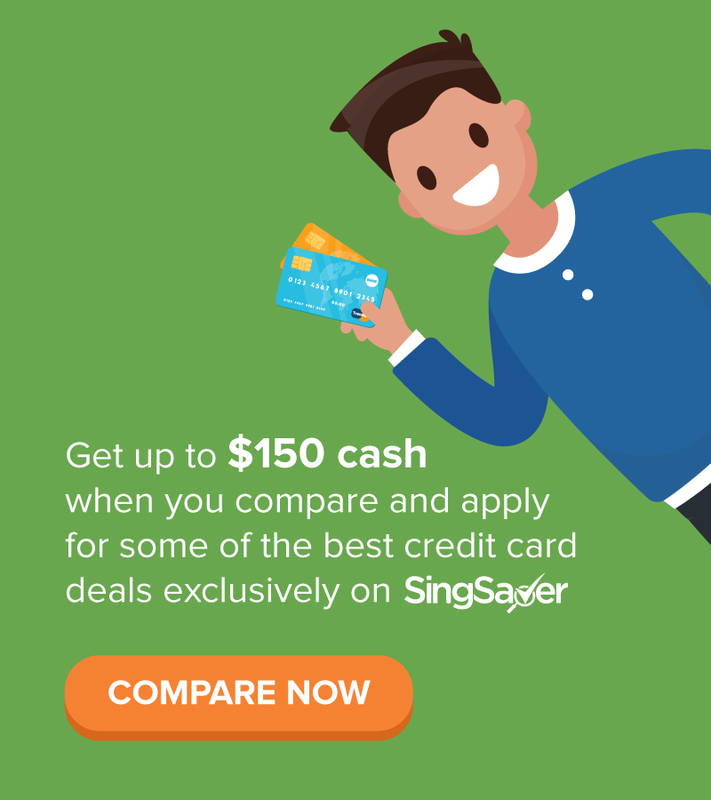 Yes, I understand that being the newest player (Cryoviva) doesn't necessarily mean they're the weakest competitor, but given that the price difference is a mere $350 for 21 years (or $1.40 a month), I'd rather pay slightly more for that peace of mind and quality reassurance (due to accreditations). 2. They're the only private bank in Singapore to offer cord blood, cord tissue and cord lining storage. Since we're talking about the future here, I don't have to have any regrets about not having stored my baby's cord lining just because the company I chose didn't offer it, especially when there's one which does. Cordlife is also among the only 6 banks in the world who offer this storage option and technology. Their patented technology, CellOptima, is exclusively offered at Cordlife only and can isolate both the epithelial and mesenchymal stem cells in our baby's umbilical cord. 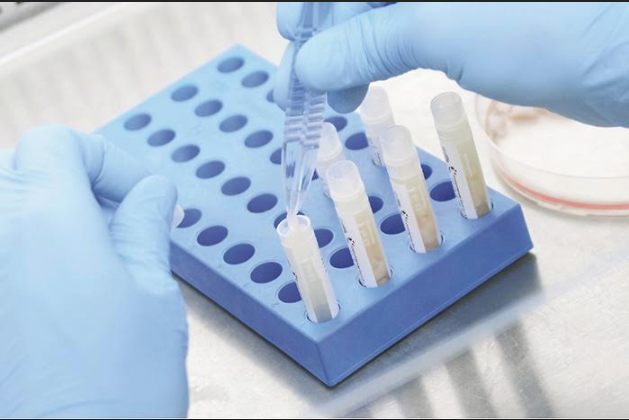 On the other hand, Stemcord and Cryoviva can only process cord blood and cord tissue from the Wharton Jelly, and are therefore not able to process or store epithelial stem cells. The yield of stem cells from the Wharton Jelly is also much lower at 54,000 cells vs. 20 million cells from the cord lining. 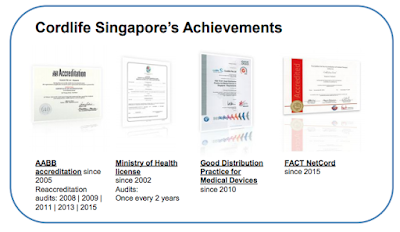 Cordlife is the only authorised company in Singapore with CellOptima, which is a patented technology to harvest and multiply stem cells from the cord lining. In other words, if you wish to also store EpSC stem cells, Cordlife is the only company in Singapore who can do it for you. Yes, it is indeed heartening to know that all three private banks are MOH-certified, but I'd want to go for the one with more accreditations for a greater peace of mind. 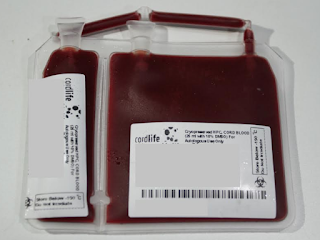 Cordlife is the only one with AABB accreditation, which is the international standard for cord blood banks. 4. They were the first to invest and use SEPAX 2 for automated processing. Stemcord only caught onto this in 2012, whereas I'm still unable to find out from Cryoviva's website whether they've adopted SEPAX 2 for their labs by now. This gives me the belief that Cordlife will continue investing in newest and latest technologies to ensure the viability of their processing and stored samples. 5. I got to visit the Cordlife laboratory and see their processes for myself. Even though I was not yet a customer at that point, Cordlife allowed us to view their laboratory where someone from their sales team explained and showed me the different stages of processing (purification, SEPAX-2 machines, ISBT 128 Standard for Cellular Therapy Coding and Labelling, storage facility, backup generators, etc). Unlike some of the other labs who only allow existing members to view, I really appreciated the fact that Cordlife was willing to open their labs up to a mere prospect (aka yours truly) who hadn't yet decided which company to bank with. Cordlife also stores the cord blood units in a 20-80 bag, so if we reallllllly wanted to just use a little bit and conserve the rest for future treatments, they technically can do that for us as well. 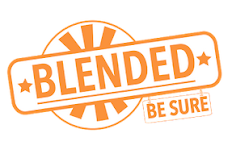 This was a concern I raised initially as I read from online reviews that some parents who chose to go with Stemcord decided based on the fact that they don't have to use up all the cord blood in one sitting. However, all of this ultimately rests on the decision of the medical doctor overseeing the case and depending on the case severity as well anyway, but it is good to know that we also have this option. 6. Their salespeople were much more responsive. I reached out to all the three private banks and met with them individually to understand more about what they could offer, and how they differentiate themselves from the rest of the competition. On this regard, Cordlife and Cryoviva were very prompt in getting back to me (within 1 - 3 business days), whereas Stemcord took 2 weeks to get back to me from when I first called them to enquire. In fact, it was only after I got impatient and followed up 2 weeks later on why no one ever called me back (using my email for this blog vs. the other two where I enquired via a personal address that was harder to trace back to my blogger status! ), that they finally got back to me. This then made me wonder if their service for existing members who are already storing with them are as prompt, or as slow. Although it might be two different teams handling sales and processing, nonetheless, it made me think twice about banking with Stemcord, and so I narrowed my choices down to Cordlife and Cryoviva. 7. Cordlife's business is well-run and sustainable. In fact, the demand for their cord blood banking services is so high that Cordlife has expanded to 8 other countries - the most among all its competitors here in Singapore. 8. 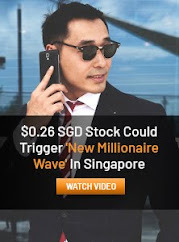 They're a publicly-listed company on SGX where I can review their financials. This is to ensure that they're always held accountable and that I can review their financials regularly to make sure they're doing well and not at risk of liquidation. Moreover, I've also recently bought their stock so I can have access to their AGMs where I'll be able to follow their updates and question their senior management if there's a need to! As such, after weeks of arduous research and speaking with a sales representative from each of the companies (including calling SCBB, to understand about donating vs. private banking), my husband and I have decided to go with Cordlife for storing of our baby's cord blood, tissue and lining. Call us kiasu, but we'll rather be safe than sorry. I was initially only for the idea of storing the cord blood because of the cost, but as my husband says, "We only have to give up on one Europe family vacation just to afford it. This is worth it, let's not have any regrets." Sounds similar to what another mummy shared online! Anyway, I hope my homework will bless future parents-to-be and aid you in making your own informed decision as well! While I've chosen Cordlife for my own, ultimately please review the pros and cons of each provider and decide for yourself which is the best for you and your baby. Disclaimer: Information in this post is accurate to the best of my knowledge as of 2018. I have reached out and personally spoken with each of the companies' sales representatives in order to consolidate the table of comparisons here to try and ensure I've gotten my data right. If any mistakes are spotted, please feel free to reach out to me with the correct data and I'll recheck to ensure accuracy of information is properly reflected. 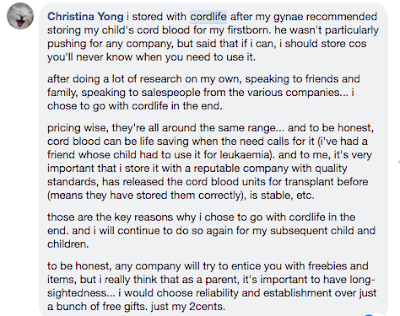 Hi SGBB, out of curiosity, did you decide to store just cord blood, cord blood & tissue, or cord blood & cord lining? Thanks!